I am scared silly to make mistakes (beware, I make them nevertheless). Right now, it would be a big mistake to waste money. On the other hand, although I have this streak of perfectionism, I am curious and like to experiment. 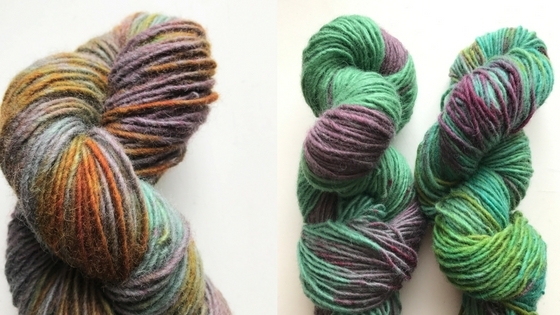 And for weeks I want to work with this beautiful and crazy expensive hand dyed yarn (look at hedgehog fibres). Result: I must make my own hand dyed beautiful yarn, but crazy cheap. The biggest costs are the ingrediencies: the wool and the pigments. White wool for hand dyeing starts with about 4 € per 100 g skein. This seems not so much, but if you do not know how much attempts you need to produce a usable skein, the price is no longer low. And you can only order a big amount… To avoid an expensive fail, I had the idea to buy weaving wool. This is an untreated rough wool which can be knitted and crochet, but is much scratchier than more expensive (normal) knitting wool. 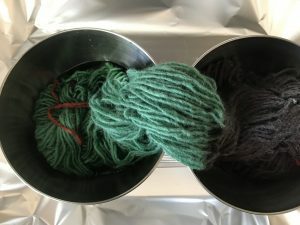 I found this wool on ebay, but not in white, but in green: for 3,5 kg 30 € – I had to buy it despite the colour. The first step is to soak the wool in a lukewarm water acid mixture. For 100 g wool, you need ¼ cup of white acid and the wool should be completely under the surface. The soaking opens the fibres. To soak the wool, you have to bind it in a circle, best done on a swift, and secure it with different coloured yarn, so it does not entangle itself. Let the wool soak for a minimum of an hour, up to 8 hours. Meanwhile prepare the colours. I used food colouring, because it is cheap and not poisonous. 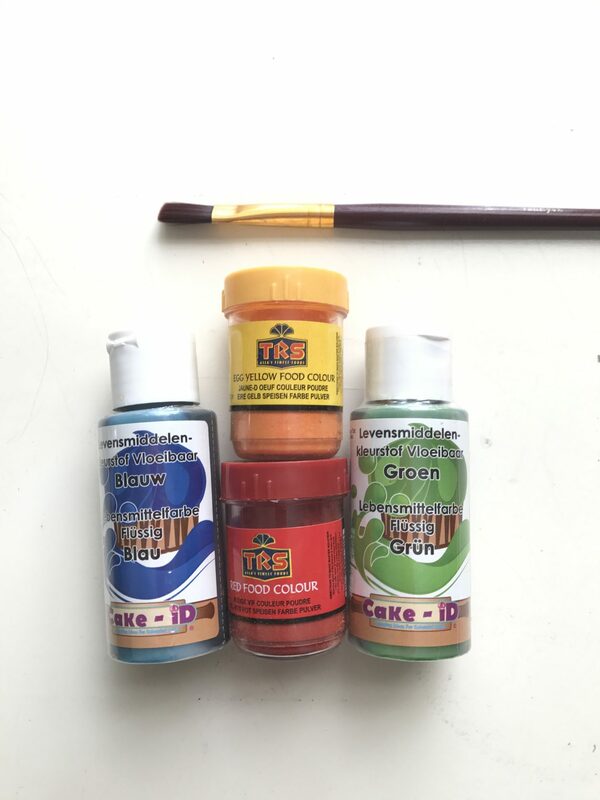 But beware, if you use the undiluted pigments you should wear a mask, to protect your lung. I diluted the pigments in a mixture of acid and water. 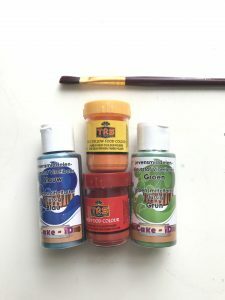 The food colouring is an Indian brand which costs only 1 € per bottle and I used about a tablespoon per colour for 400 g wool. The blue colour is a different brand. Its liquid and a little bit costlier, about 2 € per bottle. 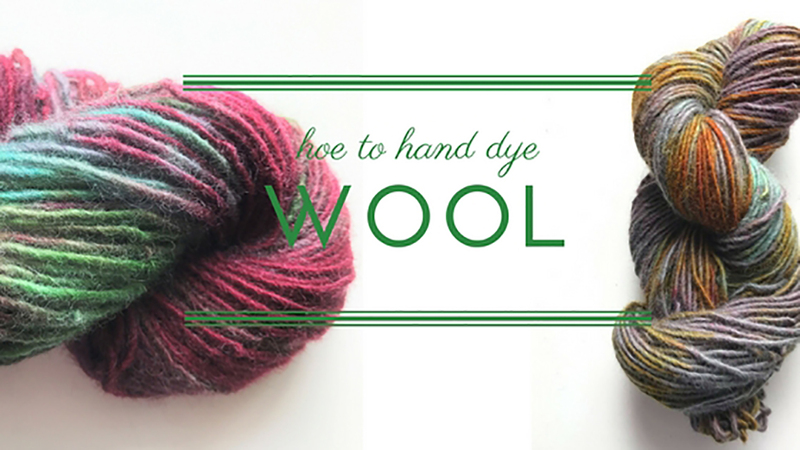 Now splash, drop, or paint the colours on the wool. You can also soak the whole or half of the skein in the colour solution. Or you can sprinkle the dry pigments on the wet yarn which results in nice speckles. To set the colour you must heat the wool. I made this in an oven. I wrapped every skein in tin foil, so that the steam cannot escape and heated it up to 80 C° for 50 minutes. After this, you should wait for the wool to cool down. when the wool is lukewarm you can rinse out the excess colour and the acid, also use lukewarm water. Be careful and do not rub or wring the wool, or it will felt. When the water stays clear, let the wool dry in a warm place, but not in the direct sun. The dry wool can be wound to cake or ball or you could through it up in the air while laughing loud and happy. All in all my hand dyed yarn cost (without my wage 😀 ) about 3 € per skein instead of the bought which starts from 15 € per skein – and I had more fun!! !